Brendan Rodgers and Jamie Vardy celebrate after the final whistle. TOTTENHAM’S WINLESS RUN in the Premier League stretched to four games as Mauricio Pochettino’s men threw away an early lead through Harry Kane to lose 2-1 at Southampton. But Tottenham are now in grave danger of missing out on Champions League football next season. Pochettino’s side remain in third but their lead over Manchester United, Arsenal and Chelsea is a precarious one with all three chasers in action on Sunday. Email “Saints defeat threatens Spurs' top-four hopes while Vardy brace seals first Leicester win for Rodgers”. 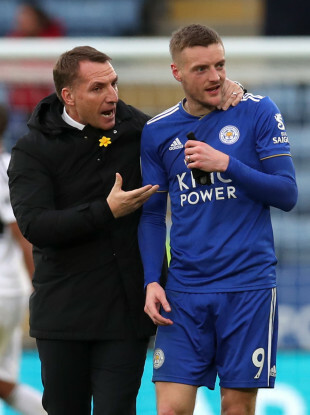 Feedback on “Saints defeat threatens Spurs' top-four hopes while Vardy brace seals first Leicester win for Rodgers”.